We explain the pros and cons of tractor-type, zero-turn and rear-engine (non-zero-turn) ride-on mowers. The most familiar type of ride-on mower is a miniaturised tractor with its engine upfront and a mowing deck suspended under the chassis. New models usually have hydrostatic transmissions (HSTs) controlled via separate pedals for forward and reverse, so there’s no clutch to worry about. While they’re as easy to drive as an automatic car, they handle like a tractor, which makes mowing around obstacles a chore. An alternative design – and one that is becoming increasingly popular because of its manoeuvrability: and practicality – is the zero-turn mower. They are driven like a tank but, compared to tractor-types, handle like a go-cart. You control them by using two levers, each connected via their own transmission to the corresponding rear wheel. Push both levers forward to go straight ahead at full speed, pull them back in unison to slow and reverse, and turn by moving one lever more than the other so the appropriate wheel spins faster. 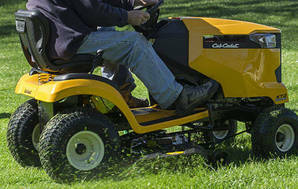 Manoeuvrability: the rear-wheel lever steering allows exceptionally precise control and the ability to spin in one spot with one wheel moving forwards and the other in reverse, which makes navigating obstacles easier while also making it more efficient for mowing a rectangular lawn, as you can swivel at the end of the lawn to crack into another run right beside the previous one. Visibility: since the engine is rear-mounted, they offer excellent visibility of the cutting deck allowing you to safely mow right up to the edges of obstacles. Speed: they’re slightly faster in a straight line than tractor mowers (by about 3km/h), though with fairly manageable top speeds of 10 to 11km/h. Learning curve: it takes a while to get used to controlling lever-steering mowers and some users find the control system daunting and very difficult to get to grips with. Cut quality: They generally don’t cut quite as cleanly on lower cutting height settings as tractor-types. Only suitable on the flat: zero-turn mowers with two free-spinning castors at the front of the chassis (like the three lever zero-turns we tested) aren’t suitable for anything but a gentle incline, as they’re liable to swing downhill on slopes. Note – because of their high centre of gravity, the tractor-style models on test are unsafe on anything steeper than a 10° incline. Note – if you’re keen on zero-turn but find twin-lever controls daunting, there are models available with a steering wheel (presently, the only examples you can get in New Zealand are from Toro and Cub Cadet). They have steerable front wheels rather than castors, and, when the wheel is turned sharply enough, they drive one of their rear wheels in reverse to spin in one spot. Since you control the front wheels, they’re safer on slopes than models with free-spinning castors. There are also smaller rear-engine ride-on mowers that are not zero-turn. They have a steering wheel, and are often less expensive, but lack the power of tractor-types or zero-turns. The way clippings are fired out further defines the types of mower. Clippings come out to the side on some types or into a rear catcher on others. They can also be mulched. Side discharge: works better on longer, rougher grass and on models with wider mowing decks. We’re told this is the most popular type of ride-on in New Zealand, with around 70 percent of the market. Most of our tested mowers are side discharge. Rear-catcher models that discharge through a chute under the seat are less likely to clog on lush grass. They are a good choice for finer-quality large lawns. The wider models have twin blades that rotate in opposite directions to sweep the clippings through a central chute. Rear catching works better when the grass is dry and not over-long. Look for models with more powerful engines for the same deck size compared to side discharge models, or narrower decks for similar-sized motors. Extra power for a given deck size helps catching performance. 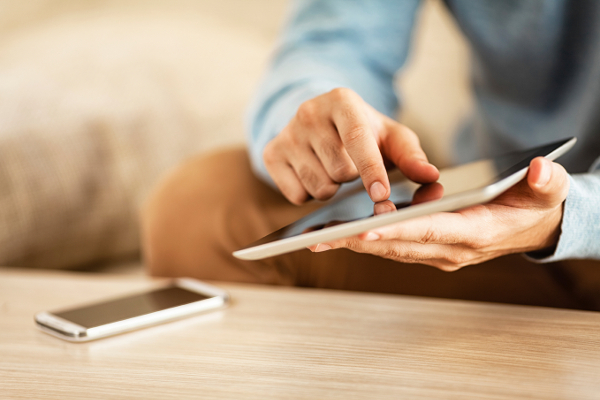 Rear-catcher models are generally more expensive when comparing similar-sized models. When using a catcher it’s best to mow the lawns more often with a light cut – removing no more than 25mm at a time. Side discharge models with a rear “bagger” attachment are said to be very prone to clogging when trying to cut heavy crops of lush grass. Cut as little as the height-adjustment will allow, in several passes and preferably when the grass is as dry as possible. An extra clippings blower can be fitted to some models. This helps to lift the clippings up the side-discharge chute. Mulching is an option on many models, including both side-discharge and rear-catcher mowers. They can quite easily be converted to mulching mowers using a mulch-plug that holds the clippings inside the mowing deck, ensuring they are chopped up more finely and blown into the lawn. Mulching can leave a very tidy finish to the lawn, as long as you don’t try to remove too much grass. Mowing several times taking 25-30mm at a time will often enable longer grass to be mowed to a tidy finish. If the engine struggles and the mower leaves large clumps you are taking too much off. Some mowers need special mulching blades, so the blades have to be changed in order to mulch, while others have a combination blade that makes changing from side-discharge to mulching much easier. Tip: If you plan to mulch, make sure your mower is supplied with a combination blade. It’s a good haggling point – ask for a mulching kit to be included in the price. Got a lot of grass to mow? We’ve uncovered great ride-on mowers for everyone from beginner lifestylers to seasoned pros.